Thank you both for the leads - I need to get on it soon if I’m to get any sleep! Places like https://www.jacksonsleisure.com/webasto/cruise/cr49/elegance/campervan/caravan/marine/fridge/ have details and some cheaper options. I had a Mariner and now have a 32. Both had the same Engel fridge. The one on the 32 gave up the ghost a couple of years ago and I made enquires. I eventually spoke to Tim Kift (Gillingham) about our fridge when it died. He offered to come and see if it could be repaired before even considering replacement. 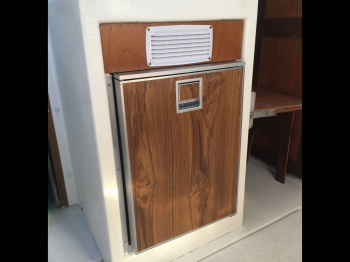 When it came out it was very rusty at the back and that fitted with the experience of a friend who had had to replace the same fridge on their Marina. 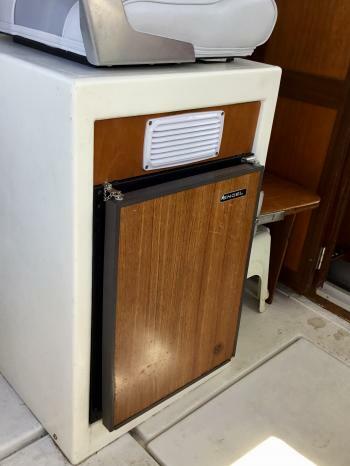 The fridge Tim brought with him was the webasto isotherm cruise elegance fridge 12v CRC 49. There of course are likely to have be updates and I think it is possible to get a dual feed one. Having said that we can run it on mains via the AUX button on the distribution board as there seems to be a ?relay? or something which I found via another saga.. It has been a good little fridge, much quieter than the Engel (though the fan runs very quietly all of the time) and the extra capacity due to the different profile at the rear of the fridge is appreciated. The new shape at the rear did necessitate re routing the waste from one of the sinks but this only needed a bit of extra pipe to go round a bend as opposed to straight to the outlet. I don't know if this would be a problem at the rear of the 25 space. I see there are some waeco ones but really it all boiled down to the space so it will be up to you and your bank manager probably in the end! Our esteemed membership secretary, Sue Sydney, has recently done just that and the replacement fits into the original space but has more capacity inside. However, be prepared for major wallet damage! I'm sure she will be along soon to tell you more.